The 3M� DBI-SALA� Hard Body Safe Bucket Insert converts the standard soft body Safe Bucket into a hard body bucket with four inner pockets for staging tools and small parts. The insert can be removed and reused, and is compatible with all standard 3M� DBI-SALA� Safe Buckets. Converts a standard soft body Safety Bucket into a Hard Body Safe Bucket.. Keeps your Safety Bucket standing upright making it easier to stage tools from. 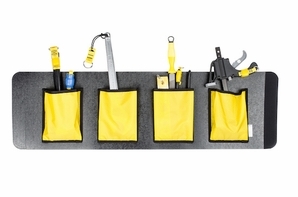 Built-in pockets allow tools to quickly be holstered and organized.